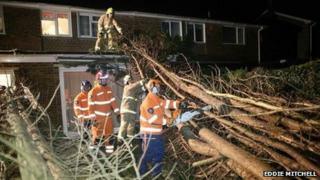 A "mini-tornado" brought down trees, damaged property and even lifted cats in the air, an eyewitness has said. People living in Chobham in Surrey said the wind hit the area at about 17:00 GMT on Saturday. The storm is also reported to have swept through Kent and Sussex. One person said it was "like something out of a Steven Spielberg film". About 13,000 customers were left without power in Kent, Sussex and Surrey after storms on Saturday. On Sunday, UK Power Networks said the number had been "significantly reduced", although about 1,100 customers were still affected. Fire crews from East and West Sussex said they took dozens of weather-related calls on Saturday afternoon and early evening. Surrey Fire and Rescue said its control room took a series of calls reporting fallen trees and damaged roofs across the county. Shirley Blay, who keeps horses at the Jolly Blossom Stables on Station Road, Chobham, told BBC Surrey: "It was a mini-tornado, I can't describe it as anything less. "It started with very heavy rain, hailstones and very strong wind and all of a sudden, the wind was very, very strong, to the point of lifting roofs. "Stable roofs were shaking and lifting and my granddaughter went to make a feed up for the pony and the shed she was in lifted. "She jumped out of it and it just shattered, it was thrown backwards and broke into four pieces. "We've got four feral cats in the yard and they were being lifted off the ground - about 6ft off the ground - they just went round like a big paper bag." She said the people and animals who were caught up in the storm were uninjured. A spokesman from Valgrays Animal Rescue in Warlingham said: "It was like something out of a Steven Spielberg film. "The sky went black, hailstones the size of 50 pence pieces hammered down on the ground, bouncing back off the ground so high. "Our fencing, which was only just put up, shattered and span around on the ground. Thunder and the lightning was horrific. "This came and went within 10 minutes, it was like a whirlwind - just swept through our village and left leaving damage everywhere." Steve Wyles, from Hunton in Kent, said: "A mini-tornado hit us at just after 5:15pm. "It lasted less than five minutes but it brought down power cables and lifted the roof off an 80ft by 20ft barn over an oak tree and dumped it 70ft away in a field. "As the wind hit I had the front door open and it was too strong for me to close it. "We had an impromptu fire display from the power cables that lasted several hours and we are aware of at least one dog that was electrocuted by stepping in a puddle." Laura Gilchrist from the BBC Weather Centre said: "Eye witness descriptions and photos of the damage suggest that an isolated small tornado could well have occurred in Chobham, however without an expert visiting the site or footage or photos of the tornado itself, it cannot currently be confirmed that a tornado was responsible."